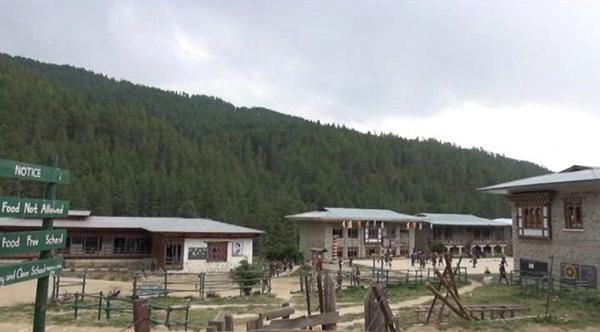 Students of Tang Central School in Bumthang are facing acute water shortage. They say the situation is so adverse that they cannot even get water to wash their faces sometimes. However, the school management claims otherwise. The management says arrangements are in place to avoid any such setbacks. At the boy’s hostel toilet, students say it has been over a month without water supply. They say water supply in the taps is erratic and completely dries up during the weekend which is the time when all the students take bath or do laundry. Requesting anonymity, students said sometimes there is no water even to cook food. The situation is no different at girl’s hostel. Sources told BBS that girls take turns to wash clothes at 3 to 4 AM when there are not many pupils using the taps. The school’s principal, Nidup Gyaltshen said the problem is not as bad as the students say. He also clarified that students are not sent outside the school campus for their safety. The principal added that they use pipes to get water from the neighboring hospital to solve the problem. He attributes the problem to the new structures that were built last year which include a staff quarter, two new toilets and the principal’s quarter. And whatever little water supply they have, has to be divided among all the users. He also said the water pipe drawn from the source itself is very thin. The school has proposed for financial support from the government to alleviate the problem. Tang Central School has 520 students, of which about 440 of them are boarders.